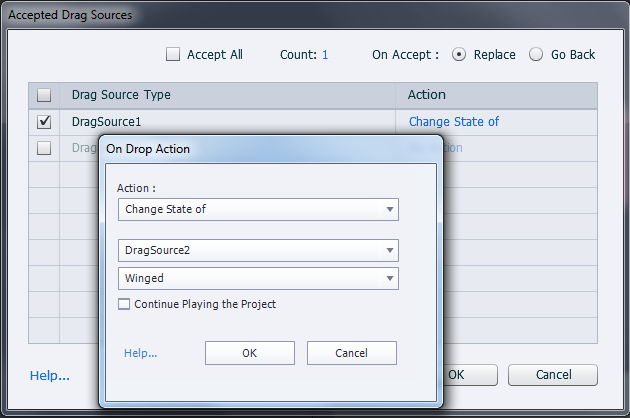 As promised in a previous article, I explored the enhancements to Drag&Drop in Captivate 9, more specifically added InBuilt States. In previous versions only buttons and shape buttons had those states. Captivate 9 added multistates to all objects and provided InBuilt states for all objects in a Drag&Drop slide: drag sources and drop targets. Custom states can be added as well. Both InBuilt states and custom states have some limitations similar to the Inbuilt states for buttons. 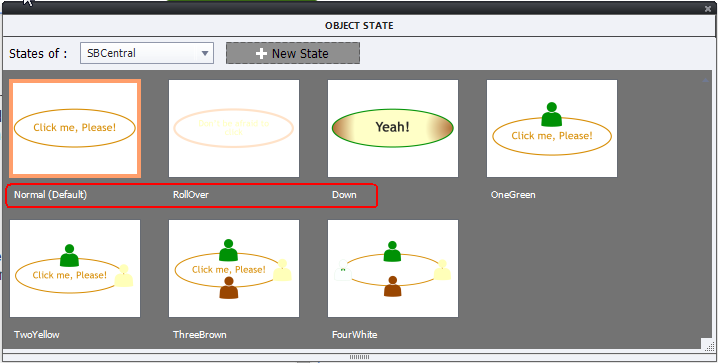 Drag&Drop objects have also limitations for added custom states. The first use case has only two drag sources, one of them being correct, the other incorrect. There is one drop target, the cup. Watch the different InBuilt states both for the two drag sources which have identical states and for the drop target. All states are introduced on slides 2-3. All objects have also one custom state. Because of my manipulation of the states on Submit, the default Reset button will not return you to a fresh start if you have used the Submit button. You'll have to use the custom 'My Reset' button in that case. In the second use case you'll see 7 drag sources and 2 target objects: the box and the trashcan. You are supposed to drag all sources to the appropriate target. You'll find the 'My Reset' button here as well. Normal state (InBuilt): is the Default state. 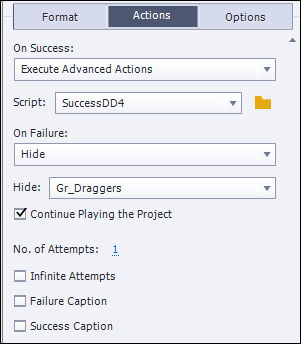 This state will appear before dragging, and will re-appear if a drag source is sent back to its original position as well (for an incorrect object). The size of this state is important, because several states are locked to the same size. You can rotate the Normal state (watch the rotate handle at the top), which will also lock some of the states to the same rotation. Dragover state (InBuilt): this state appears when the drag source is over a drop target and will remain so until the object is dropped on or moved away from the target. This state is not locked, it can be resized and rotated. DropAccept state (InBuilt): will appear after dropping a drag source on the drop target, it will replace the Dragover state and become permanent. It is totally locked (watch the lock symbol bottom right): will keep the same size as the Normal state, cannot be rotated. Be careful: if you allow all drag sources, both correct and incorrect, to be dropped on the target, the DropAccept state will also appear for correct and incorrect objects! If you only allow the correct drag sources to be dropped, this state will only appear for them. DragStart state (InBuilt): this state appears when you start the dragging movement until you are over a drop target, where it will be replaced by the DragOver state. The state is not locked, it can be resized and rotated. The Drop Targets have 6 InBuilt States (see slide 3 in movie). Three of those states have a name that is identical to an existing state for the drag sources: DragOver, DropAccept and DropReject. For Drop Targets you can add objects to all states, both InBuilt and custom states. Some states appear immediately, other states only appear after Submitting the exercise. Here is the overview, again with a visual reminder from the first use case in the example movie. Normal state (InBuilt): is the Default state. This state will be the main state before the Submit button is clicked. It can be replaced by another state but that will only be for a short duration. The size of this state is important, because several states are locked to the same size. You can rotate the Normal state, which will also lock some of the states to the same rotation. Dragover state (InBuilt): this state appears when a drag source is over the drop target and will remain so until the object is dropped on or moved away from the target. This state is not locked, it can be resized and rotated. DropAccept state (InBuilt): will appear after dropping a drag source on the drop target, it will replace the Dragover state. However this state will remain visible only for a short duration. Then the Normal state will re-appear. The reason is that a drop target can accept multiple drag sources, and has to be ready to 'accept' or 'reject' the next drag source. It is totally locked: will keep the same size as the Normal state, cannot be rotated. But, as told, you can add objects, which was the case in the example movie (adding the wings). DropReject state (InBuilt): will appear after dropping an incorrect drag source on the drop target if the target is not set to allow All objects to be dropped. It will replace the Dragover state. The state will appear for a short duration before reverting to the Normal state. State is It is totally locked: will keep the same size as the Normal state, cannot be rotated. But, as told, you can add objects, which was the case in the example movie (adding the wings). DropCorrect state (InBuilt): this state will appear after Submit if the drag source(s) dropped on the target are all correct. It will replace the Normal state permanently. The state is fully locked (to the Normal state): no rotation nor resizing is allowed. You can add objects. DropIncorrect state (InBuilt): this state will appear after Submit if the drag source(s) dropped on the target are not all correct. It will replace the Normal state permanently. The state is fully locked (to the Normal state): no rotation nor resizing is allowed. You can add objects. Custom state: this state is also fully locked to the rotation and size of the Normal state which is limiting even though you can add objects. The default Reset button has been added to both use cases (slide 4-5). This button can only be used to reset before submitting the result. I added an extra button 'My Reset', which is really the Replay2 button described in a previous blog post. If a D&D slide is not included in a quiz, has not score it will be reset when you re-enter the slide. This is what I'm doing, getting back to the last frame of the previous slide, then continue. That may result in some flickering, depending on the bandwidth, but the D&D will be totally reset. The mentioned blog post explains the need for a user variable v_enter to store the first frame number of each slide with an On Enter action. Effects are time-based, starting after the pausing point of the Drag&Drop (1.5secs which is default). Back and Next buttons have no pausing point in this slide. When the playhead is released by the Success event, it has to continue seamlessly to the end slide 6. For the correct answer all Christmas balls have to be dropped either in the box (2, 0, 1 and 6) or in the trashcan (3, 4 and 5). There are no object actions in this use case. Version 9 has been released about 10 days ago, while I was on vacation. My fans know that I seldom will post immediately a 'full' review, because I want first to play around a little bit, to try out some reported new features before offering my personal reflections and tips. You will not read anything about the new Quiz features, nor about the enhancements to Responsive projects today, maybe later on in another article. There is too much to write about! I will offer some tips about those 4 major new features when you have played with this slide. Refreshing the browser will allow you to restart the movie. Of course I discovered also some little gems hidden between the big diamonds, while exploring. 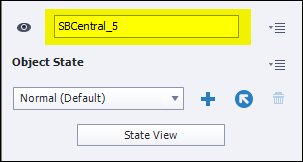 In Captivate 8 it was possible to create 3 states for shape buttons, both in the Object Style Manager or individually using the Properties panel, Style tab. In this example you did see that the 'default button states' (Normal, Rollover, Down) can even have a different label, not only a fill and a stroke applied to them. 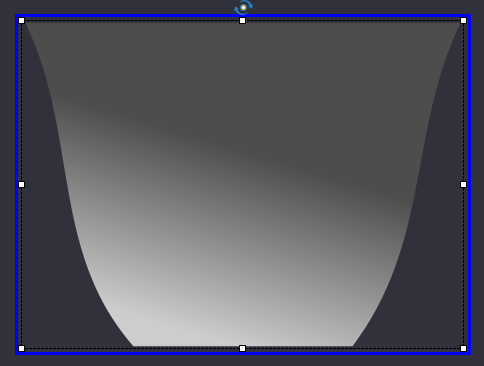 Look at this screenshot of the Object State panel for the central oval shape button in the movie. Watch the default states (marked by red rectangle) and the extra 4 states I added to end up with 7 different states. For the four extra states I used SHIFT-CTRL-ALT-Z to Duplicate State a couple of times. You'll find the option also in the right-click menu on a state. Drag&Drop objects also have InBuilt states, but will blog about Drag&Drop in a future post. You see the usage in the Library as for other assets. Example: the SVG ManGreen has been used 4 times, in the 4 states of the central shape button. 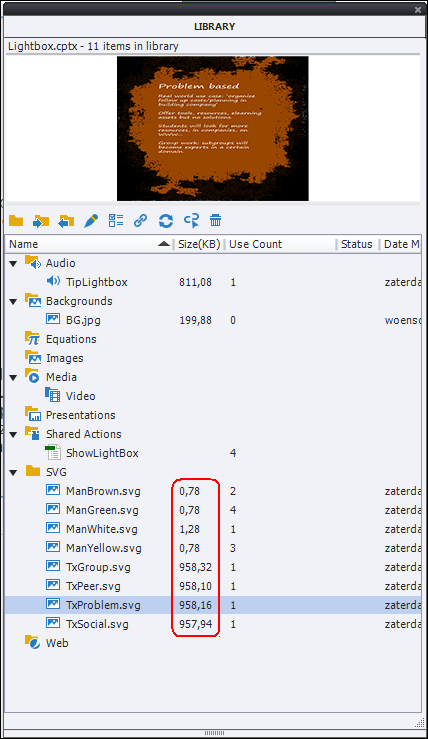 The man-SVG's are very small, but the lightboxes with text are using a complicated filter and size is much bigger. 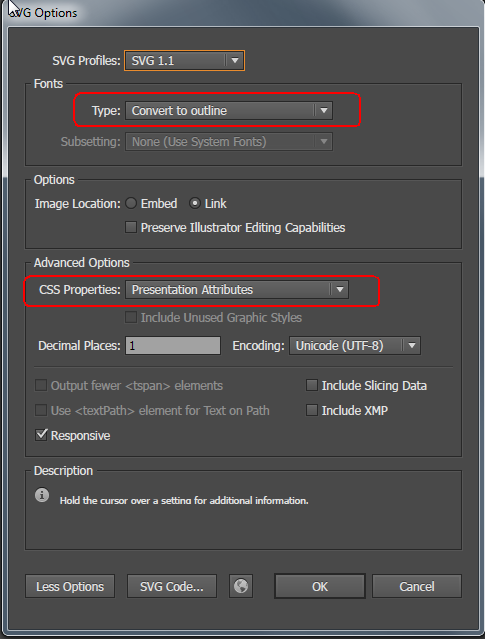 The settings used in Illustrator to save these files as SVG are visible in the next screenshot. To preserve the font, you have to convert it to outlines. 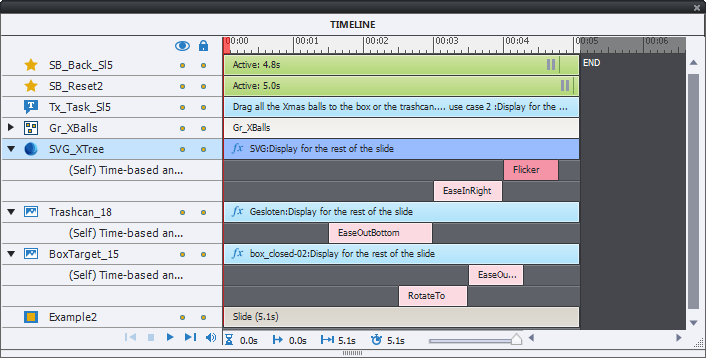 You can use the same shortcut keys for effect timelines as for the object timelines to increase/decrease its length. 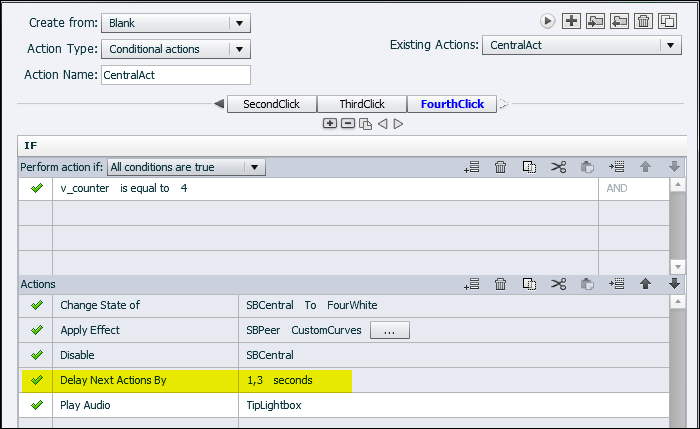 That is a valid alternative for typing in a value in the Timing panel or for dragging with the mouse. Example: right arrow key will move the whole effect timeline 0.1sec to the right, CTRL-Right will move over 1sec, SHIFT-Right will increase the timeline duration with 0.1sec. All arrow combinations shortcut keys described in this old article: TinyTimeline Tidbits are functional. I regret that CTRL-E, which extends the duration till the end of the slide has not been included for Effect Timelines. Neither does CTRL-L move the effect timeline to the playhead position, it will move the object timeline with the Effect timeline even if the Effect timeline is the selected one. For the custom motion effects (scribble, curved, line) start with the cursor over the present location of the object, and the beginning of the path will snap to the center point of that object (more precise: the center point of the bounding box). You can uncheck 'Show motion paths' if your screen is getting too crowded, look in the Timing panel just above the fields for Effect Start and Effect Duration. BTW you can increment the values in those fields using arrow keys: UP for 0,1sec, SHIFT-UP increments to the next full second. Field has to be selected in that case. If field is not selected you can use the typical Adobe scrubber. Change State: available for simple, advanced and shared actions. This command needs two paramaters: the object and the state; for a shared action both will be compulsory parameters. 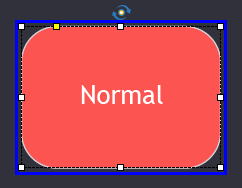 I used this command a lot in the example movie, both in a conditional advanced action (on the central shape button) as in a shared action triggered by the four bubble shape buttons. Delay Next Actions by: finally you will be able to time commands in the sequence for standard/conditional advanced and shared actions. This new command takes one parameter: the amount of time which can be a literal or a variable. 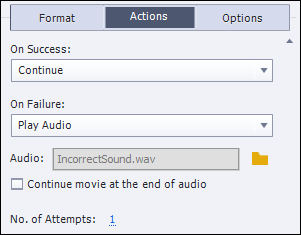 In the next screenshot you see that I used it to play the audio clip after the custom effect (with a duration of 1.2secs) has been finished. That parameter is a 'candidate' parameter, not compulsory, when you use it in a Shared action. 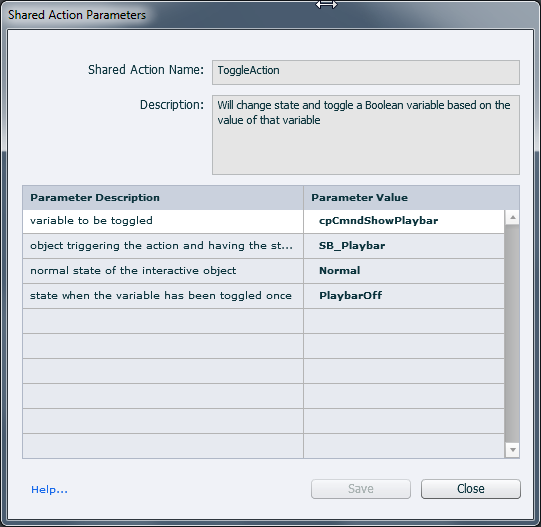 For more information about parameters see the article Parameters in shared actions. The situation is the same in Captivate 9 as it was in Captivate 8. Personally I am very excited about the this new command, which allows better control over timing by advanced/shared actions. Also about timing, not a new command but an improvement of the command Apply Effects in an advanced/shared action: you can now add values for the Start time and the duration of the effect. Drag&Drop until Captivate 8 didn't have a Success Caption by default. I explained a workaround in Drag&Drop Tips. 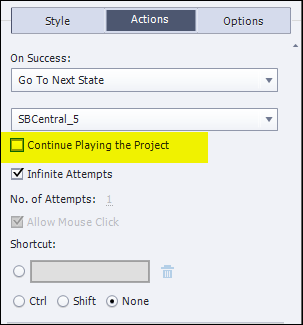 You can forget about that tip in Captivate 9, Success caption is now available. It uses the default Success Shape or Success Caption style, depending on your Preferences and theme. 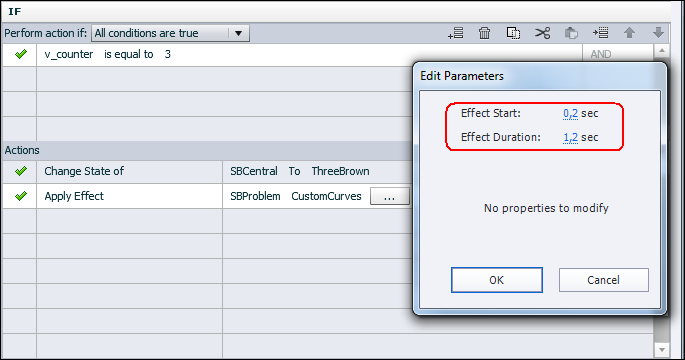 Captivate 9, 2017 users: there is no change about system variables in both versions, you can download the same table. 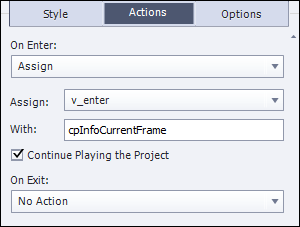 The post 'System variables in Captivate 6' has been very popular, probably because it offers more details than what can be found in the documentation of Captivate itself. 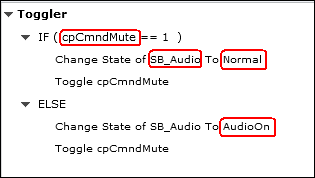 Later on I mentioned some new variables in Captivate 7 in the post New Features in 7.0.1. Time to upgrade the table for Captivate 8, you can download (for free) the pdf from here. The document is encrypted to discourage abuse. You will be able to print it at low resolution (150dpi) and it can be read by a screen reader. The table was first proposed at the Adobe Learning Summit presentation about Advanced and Shared Actions. cpInfoGeoLocation in a new category 'Mobile': returns the geometric location when using a device on which such detection is enabled. This is the first variable that has not one but three components. Latitude, Longitude and Accuracy are numbers. There are several tutorials around, like this one.